How to install Slideshow Script PHP? 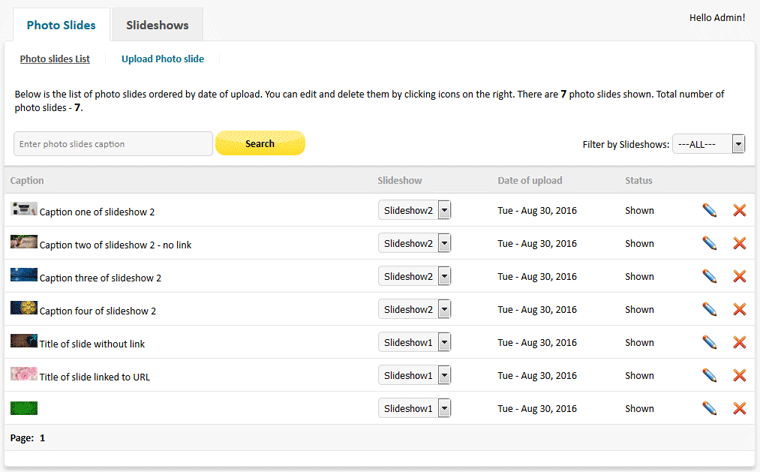 How to use Slideshow Script PHP? How to use options in admin area? How to put the Slideshow on a web page? 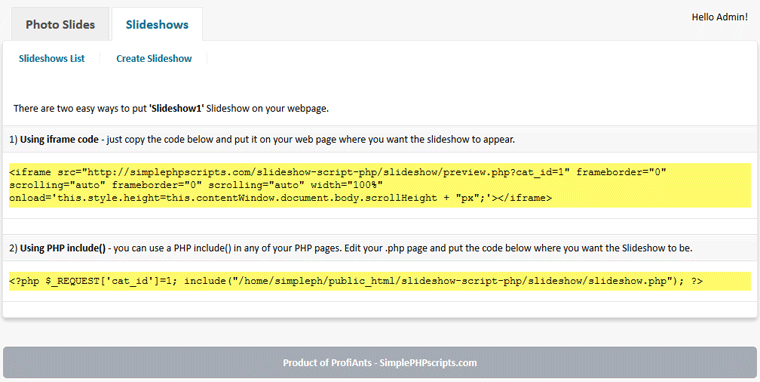 How to install Slideshow Script PHP? Slideshow Script PHP require PHP 5.3 or higher version and MySQL 5.0 or higher version to run on your server - you can see the current version of PHP and MySQL in the control panel of your website. 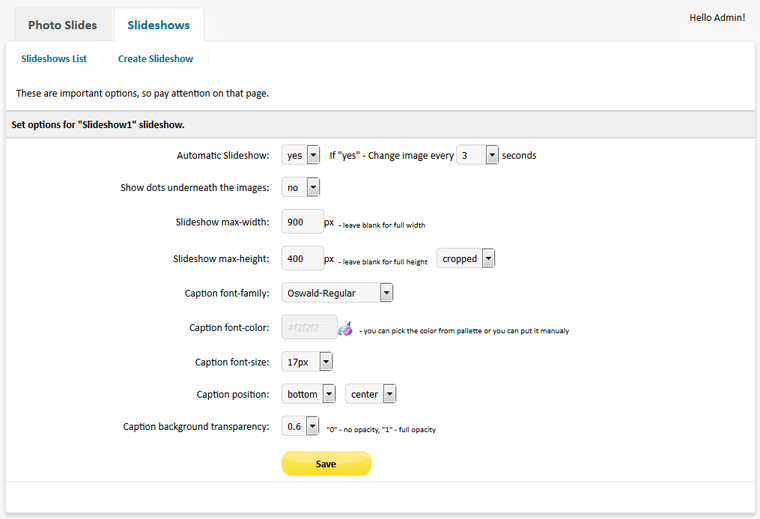 How to use Slideshow Script PHP? Browse the photo you want to add to the slideshow, add caption, and if you want the slide to be clickable - just paste the URL in "Photo Slice link". 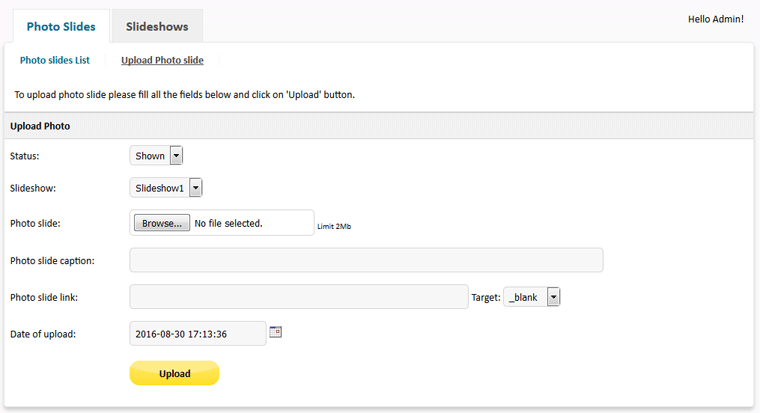 Then choose whether to open in new window(_blank) or same page(_self) and cilck on "Upload" button. Here you may set the slideshow to be automate or manual. If automated change slide on every "X" seconds. Show dots/bullets underneath the photo slides. Set maximum width and/or height of the slideshow, if any photo is higher than the slideshow max-heigh - the image could be cropped or resized. And also you may stylize the captions of the slider, choose whether to place the caption at the top, bottom, left, right or center. There is another option to set the background of the caption to be transparent or solidity colored. How to put the slideshow on a web page? Then open the page(using html editor) where you intend to place the slideshow and paste the code between <body>code</body> tags. Then preview your page in the web browser.